Vita Nostra by Marina & Sergey Dyachenko was a featured book at San Diego Comic-Con in July 2018. I wanted to read it since then, and I am so glad I did! 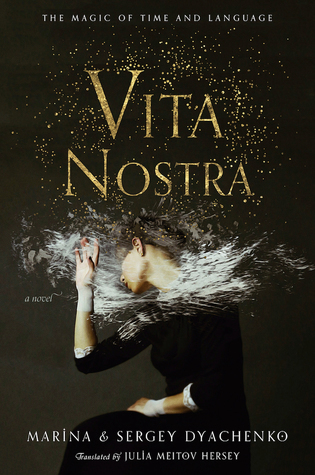 I knew very little about Vita Nostra going in, and I think that is the ideal way to experience the book. Not to discourage you from enjoying my blog, but if you are thinking of reading the book I would recommend you don’t read too many reviews. If you can’t be dissuaded please get ready for the gush of a lifetime. The definitive English language translation of the internationally bestselling Ukrainian novel—a brilliant dark fantasy with “the potential to be a modern classic” (Lev Grossman), combining psychological suspense, enchantment, and terror that makes us consider human existence in a fresh and provocative way. As she quickly discovers, the institute’s “special technologies” are unlike anything she has ever encountered. The books are impossible to read, the lessons obscure to the point of maddening, and the work refuses memorization. Using terror and coercion to keep the students in line, the school does not punish them for their transgressions and failures; instead, their families pay a terrible price. Yet despite her fear, Sasha undergoes changes that defy the dictates of matter and time; experiences which are nothing she has ever dreamed of . . . and suddenly all she could ever want. The final paragraph of that lengthy synopsis promises to take you to a world far beyond that of The Bear and the Nightingale, and I feel that is very accurate. I didn’t find a ton of similarities between Nightingale and Vita Nostra, but the philosophy & logic of Vita Nostra reminded a great deal of Zen and the Art of Motorcycle Maintenance by Robert Pirsig. This book will make you ask a lot of existential questions. What is language, what does it mean to be human, is there such a thing as fate? To get more into the character and the plot, I need to summarize some of the events in the book. Early on, Sasha and her mother are on vacation at the beach. Sasha comes in contact with a man she finds frightening, though she can’t quite explain why. He makes a strange, though not impossible request, and she decides to comply with him. Their unorthodox relationship continues, and the man eventually invites Sasha to a special university where the bulk of the narrative takes place. Her decision to attend this university is motivated in part by genuine curiosity, and in part by the fear of what may happen if she refuses. This is not your everyday school. Students are given texts in a language they don’t recognize & audio tracks of complete silence to interpret. Sasha has to work & study harder than she ever has. The descriptions of studying, and struggling to understand new concepts really resonated with me. I have never found a more relatable account of the learning cycle. The Dyachenkos do an amazing job of highlighting common pitfalls and motivators for anyone in higher education. Perhaps the most frustrating element of her studies is that Sasha doesn’t really know the end goal of her all her hard work. Sasha really is the only major character in Vita Nostra, though her experience is heavily influenced by several peers and instructors. Romance is not a major focus in the book, though the role of all interpersonal relationships comes to the fore a great deal. The book presents ideas about how to better sympathize and empathize with others. The more Sasha pulls away from her “normal” life, the more interpersonal challenges she faces. Her methods of dealing with each challenge change drastically as her years of schooling fly by. I was interested in reading Vita Nostra largely because it’s a translated work. The Russian influence presented itself in the form of heavily regimented schooling and abusive authority figures. Though it isn’t necessarily a violent book, the role of violence is important to the premise. It is a highly allegorical work weaving a tale of mystery and strife to illustrate the difficulties of coming of age. Vita Nostra is a rare and singular book. I doubt I will ever find anything else quite like it! If you enjoy heady speculative fiction, I highly recommend giving this one a try. It’s on shelves now! This book sounds soo good! I definitely should check it out ! Hmm I’m intrigued but I think I have to be in a specific mood to read it. Oh yeah, it’s definitely an atmospheric mood read!